A.D. 1262: In the dusty heat of French fields, knights battle for supremacy in a fierce tournament. At its violent heart is Edward of England, who leads his men under the banner of the dragon, a potent reference to the legendary King Arthur. As heir to the throne, Edward has a vision for his future kingdom – a vision sprung from the words of an ancient prophecy written in the time of Arthur himself – that will change the face of Britain forever. A.D. 1286 Scotland is in the grip of the worst winter in living memory. Some say the Day of Judgement has come. The king of Scotland rides out from Edinburgh into the stormy dark. On the road he is murdered by one of his own men, leaving the succession to the throne wide open. The king’s death is as a stone thrown into a pool, the ripples spreading far and wide. Civil war threatens as powerful Scottish families jostle for power, not knowing that Edward, now king of England, has set his own plans in motion. But all is not destined to go Edward’s way. Through the ashes of war, through blood feuds and divided loyalties, a young squire will rise to defy England’s greatest king. His name is Robert the Bruce. And his story begins in Insurrection. 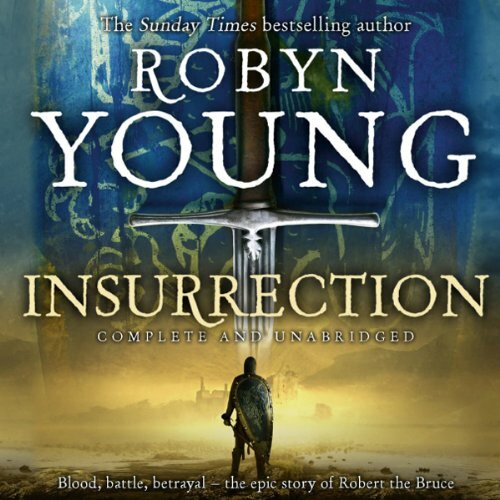 I have read Robyn Young's series on the Templars, with rather mixed feelings, as she can be very wordy, so I thought I would try her new novel as a talking book. The book is set in the period of Edward I, 'The Hammer of the Scots', and deals with the quelling of insurrection in Wales, and in Scotland. (Edward was inclined to feel that Scotland should not be an independent kingdom). It is a time when Scottish lords were often Norman barons, owning lands in Scotland and England, with very divided loyalties. It is the period of King John Baliol, William Wallace and the main character of this book, Robert the Bruce. It moves backwards and forwards in time to explain the development of the situation, and this can at times be confusing, but as you get into the book, this becomes clearer. The gore is not spared! This was a time when the north of England was left as a wasteland-a scorched eart policy with a vengeance. It isn't how one thinks of 'chivalrous knights'. After the battle of Stirling Bridge, Wallace ordered 'No quarter', and the English were horrified to find this meant that the knights weren't spared for ransom as was usual. Yet this was done to avenge the thousands of civilians Edward had ordered killed when Berwick was taken. The development of the character of Robert the Bruce from a lad, at odds with his father, is well drawn. He has a claim to the Scots throne through his descent from Malcolm Canmore, but other than feeling aggrieved that Edward supports Baliol, does not see for a long time that he is failing in his duty by not supporting Scottish independence. Nick McArdle does a wonderful job as the narrator-very important when you are listening for over 20 hours. Really enjoyed the story. This is a period of history that I do not know much about. Very well written and narrated. More of the same please! Thoroughly enjoyed this book. Although a long one it was very easy to get through as the narrator brings the characters alive and the story has many twists and turns. Found the narrator a bit boring when he read this great story. However like normal a great historical novel a good book all round. I will listen to the second book. Has Insurrection put you off other books in this genre? Who might you have cast as narrator instead of Nick McArdle?